Together with our Church school, St Philip and St Paul with Wesley is a busy and loving place – Welcome, acceptance, fun, exploring, challenge… just some of the things that are important to us here whether in Sunday worship, at home or at work during the week. We are a church family where it is OK to bring your questions and to take your time to discover what the Christian faith is all about. We are people of all ages wanting to learn from each other. An LEP (A Local Ecumenical Partnership) , we are both a Methodist and Anglican Church community. Our partnership over the last 15 years has opened up all sorts of creative possibilities. 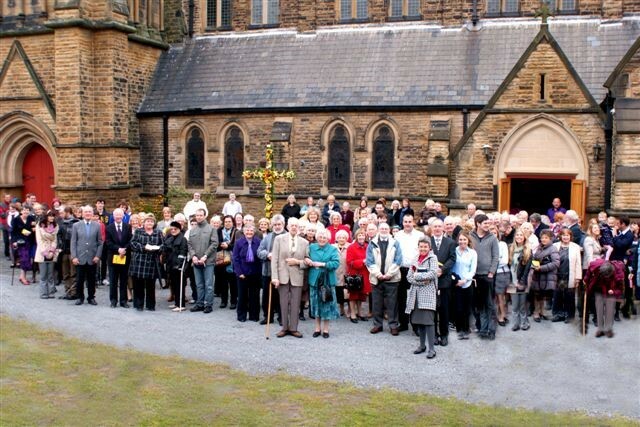 Our ministers work closely together, and many from our congregation are actively involved in the life of the church. Our services, all joint, reflect both our traditions. We offer offers a variety of styles. On Sunday mornings, we meet at 10.30 for our main service. There is a crèche for the under 3’s that people are welcome to use, and activities for the 3’s to 16’s during the second part of our service. Once a month we have a Communion service, and once a month we have an all-age parade service where we welcome our uniformed organisations. Where there is a baptism, this usually takes place in our 10.30 service. On Sunday evenings, we offer a service that meets in the comfortable lounge. It is prayerful, reflective and relevant. Once a month, on the 2nd Sunday there is also a Said Communion service that meets at 8.30am. Our church has a mixture of Victorian architecture and modern facilities and is a hub of activity 7 days a week by church, school and community groups. Our church life continues in people’s homes during the week in our small Lyfe groups where people can explore faith together and share lives.